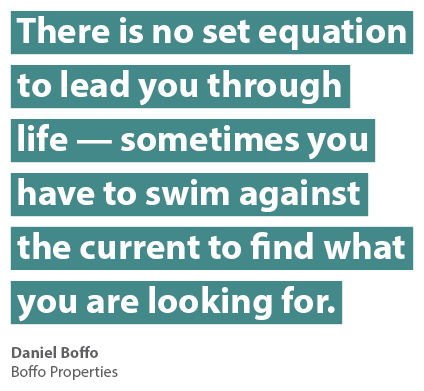 This week's Next 20 community builder is Daniel Boffo. Daniel, along with his sister, Flavia Boffo Punzo, are the Principals of Boffo Properties, a Vancouver-based family run development company started by their father, Tarcisio and in business for over 50 years. They created the Boffo Foundation which supports Vancouver's The Kettle Friendship Society and the Watoto village in Uganda. There are many definitions of creativity out there. One that resonates with me is by Dorothy Parker that states, "Creativity is a wild mind and a disciplined eye." To me, this definition reflects the balance between spontaneity and structure that I seek to find in my own work and life. I've been inspired by many creative people in history. Artists like Matisse (after whom we named our daughter), politicians like Lincoln, and entrepreneurs like Steve Jobs - these individuals all had vision and were bold enough to do things differently. Art is the spark that pushes society to think differently. I have a business to run so my creativity comes in the form of exploring how to run my business and make profit and do some good. Building on the idea that creativity is about doing things differently, the Kettle Boffo Project is one example that I can share that describes our efforts to do things differently. It started when we acquired property at Venables and Commercial Drive on either side of a non-profit called the Kettle Society - an organization who for over 40 years has offered housing, employment, advocacy and mental health services to people normally overlooked in our society. After exploring different options, it was clear to us that there was an opportunity here to go beyond just a status quo development. In close consultation with the Kettle Society, we developed a proposal to amalgamate our site with The Kettle Society as well as the city-owned parking lot to the north to produce a 12-storey building that includes a market component (200 residential units and 18,000 square feet of retail space) and a social component (a much needed new space for the Kettle Society to operate plus 30 units of supportive housing for their clients). We didn't approach this as a charity project but rather as an everyone project. And while we had the choice to do a status quo development that could have been built by now, we chose to do things differently and find a way to support the common good. My curiosity is sparked by design. I admire good craftsmanship, attention to detail and simplicity. I like to take time to admire a window sill and study how a neighbourhood's streets interact with its buildings and compare the feeling of sitting in one desk chair over another, and evaluate how a business card feels when someone gives it to me. The experiential part of art and creativity is what I value most. For some reason as we get older we tend to get cynical about things and start taking less risks, so protecting the youthful spark of being a possibility thinker is key to promoting the development of creativity. Any advice for young people today? My advice for young people today is that there is no set equation to lead you through life - sometimes you have to swim against the current to find what you are looking for. How does art push you to think differently?